The basic Sewer Design Standards and Guidelines are designed for two different types of sewers, sanitary and storm. Size: Sanitary sewer mains shall be of adequate size to convey population generated (peak dry weather) flows, plus a general allowance for inflow and infiltration, plus an allowance for inflow allowance for manholes in sag locations. The inside diameter of sanitary sewer pipes must measure at least 200 mm. 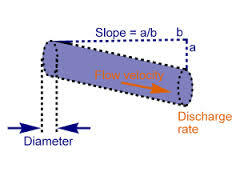 Free Online Manning Pipe Flow Calculator pipe flow calculator at hawsedc.com.